You can get the basic information about Buddhism at public lectures that we organize every second Monday (we can offer a translator, please ask for it). The Prague Buddhist centre offers to those interested in Buddhism every day a meditation on the 16th Karmapa (every Thursday in English). 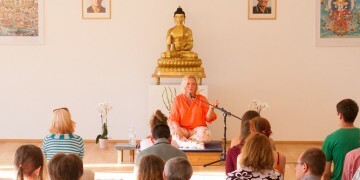 In addition, we organize weekend meditation courses, lectures by lama Ole Nydahl, days of Open Doors and other events. One can always get the details and the information about the actual programme on our website. We are looking forward to seeing you. The public lectures about Buddhism take place every Monday at 8 pm. Always on a different topic, they are suitable for a general audience as well as advanced practitioners. They are given by Czech teachers who are students of lama Ole Nydahl. Time for questions and answers always follows the lecture. 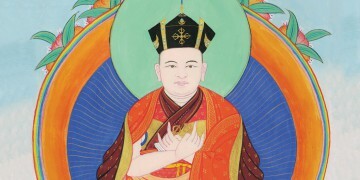 We meditate on the 16th Karmapa at 8 pm (Thursday in English). This meditation was given by the 16th Karmapa himself as the most suitable everyday practice for the modern world. The meditation is guided. If one has just begun to meditate, it is fine enough to just come and ask for a short explanation before. We offer meditation explanations every Wednesday at 6.30 PM. The explanation is fit for those who want to start to meditate regularly. It is advised that one first visits couple of Mondays‘ public lectures before and gets to know the meditation offer available in Diamond Way Buddhism, though.